Review: The Radical Camera. New York’s Photo League, 1936-1951. New York: Jewish Museum, November 4, 2011-March 25, 2012; Columbus, Ohio: Columbus Museum of Art, April 19-September 9, 2012; San Francisco: Contemporary Jewish Museum, October 11, 2012-January 21, 2013; West Palm Beach: Norton Museum of Art, February 9-April 21, 2013. Catalog: $50.00 (Paperback), available from Powell's, a union bookstore. The Radical Camera is one of the finest displays of twentieth-century photography I can recall; except that the curators have chosen the occasion to point out the really important fact, to them: Berenice Abbott, Weegee, Aaron Siskind, Ruth Orkin and other major American photographers of the twentieth century were, thank heaven, more photographer than brainwashed Commie dupe. There doesn’t seem to be a single major American photographer of the ‘thirties and 'forties who wasn’t associated in one way or another with the Photo League, a small, loose association of photographers headed by Sid Grossman, himself an artist of considerable skill. The League was an offshoot of the Worker’s International Relief (Internazionale Arbeiter Hilfe, or I.A.H. ), the left-wing organization founded and run by Willi Münzenberg, a brilliant media organizer from Germany who in 1934 had come to the United States to help set up various American progressive groups. In 1947 the US attorney general issued a list of organizations deemed to be “totalitarian, fascist, Communist, or subversive:” the Photo League was on it. Then in 1949 a certain Angela Calomiris came in from the darkroom, announcing that the League was a Communist front, with Sid Grossman as the point man. The League closed in 1951. All of which is incidental—incidental, that is, to what the curators think “good” photography should be: at the Jewish Museum, visitors are greeted by a weasel quote from Beaumont Newhall, quondam head of Photography at the Museum of Modern Art, claiming that at the Photo League “There was almost a sense of desperation in the desire to convey sociological import;” as if conveying sociological import was a particularly hopeless kind of enterprise, at odds with what would come naturally to real photographers and artists: say, pictures of kittens. In 1937 Newhall curated a standard-setting exhibition of photography for the Museum of Modern Art from which the Photo League was absent, much as Henry-Russell Hitchcock had expunged the architecture of Red Vienna from the MoMA's standard-setting exhibition of Twentieth-Century Architecture in 1932. Being an artist or an architect and socially conscious could only be a hindrance on one’s aesthetic sensibilities, just as being a Jew in Vienna could only be a hindrance to achieving anything based on merit, not money. Just as orthodox Marxists invent an “imputed class consciousness” to describe what the Working Class should be thinking if it were to think the way Marxists think it should, so, too, the curators have invented an “imputed aesthetics” which the photographers in this show are assumed to have followed, whatever their pretense at being socially conscious. After all, being an artist or an architect and socially conscious can only be a hindrance to success, not so, Professor? All the same, the stunning beauty of these photographs is attributable to a specific “socialist” aesthetic which is not at all at odds with their aesthetic qualities but an integral and irreplaceable part of it. 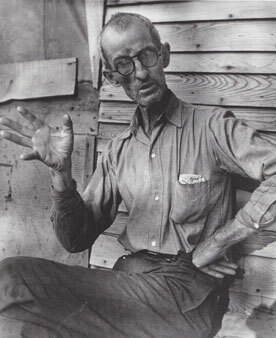 Take Sid Grossman’s portrait, Henry Modgilin, Community Camp, Oklahoma (1940)—doesn't every photographer wish she had? At a glance the viewer recognizes the antitype of the soulful closeups of sharecroppers’s faces beloved of Walker Evans in Let Us Now Praise Famous Men: Henry Modgilin is caught in mid-discussion, equal emphasis on his gesturing hands, his face, his posture, his background, which is to say that each aspect is presented as an ideograph to be deciphered in its own right. A few blocks uptown from the Photo League studio in Manhattan, the art historian Erwin Panofsky was lecturing about the late medieval genre of the Andachtsbild, the Image of Devotion: a figure of Christ, for instance, that the viewer was encouraged to confront head-on and eye-to-eye, in the same manner that a visitor at the Museum of Modern Art (say, for its Family of Man show of photographs in 1955) would eventually be called on to confront herself in the act of confronting some image of a worker or a homeless person or African, her undifferentiating gaze a token of the “authenticity” of her own experience. This is precisely what Henry Modgilin is not; and the curators are bothered enough to mention in the accompanying signage that Grossman “accentuated the tones in order to dramatize” the various parts of the picture. In case you didn’t know, photographers choose certain apertures in order to get certain effects; they crop and adjust photographs; they manipulate the light so that the viewer’s gaze is directed towards certain parts of the image and away from others. That’s what photographers do. It’s also what sociologists and anthropologists and social workers and maybe even community organizers do when dealing with a client, a tribe, a target population: they separate out the various elements that they hope will reveal the meaningful aspects of the subject and his environment. In this case, it appears, Sid Grossman has used a certain amount of solarization to delineate and separate out each part of the composition. To the curators this comes across as some evil Communist plot; or maybe some evil Socialist plot. Or Muslim plot. Whatever. Strand's Wall Street, New York of 1915 reads like the illustration to a sociology textbook, by Georg Simmel no doubt: anomie, blah, blah; Modernity, blah, blah; the individual in the big bad city a mere cypher of his social class, blaaah. Hine had studied simmelian Sociology at the University of Chicago; Simmelianism was a stock-in-trade of the progressive liberal clique at the New Republic. Whatever the considerable formal qualities of this image, they're served up on the side: Strand's image is a sociological Andachtsbild. Yes. It is exactly what we do in the cinema, combining shots that are depictive, single in meaning, neutral in content–into intellectual contexts and series. Reality is a construction. Of course, life has to be observed in order for this reality to be achieved. In no way, however, is it to be found in the more or less random series of observations in reportage; it is contained exclusively in the mosaic that is constructed from the individual observations, based on the recognition of their content. In the early 'thirties such theories were in the air. Benjamin himself had borrowed a good deal of his argument from the Constructivist László Moholy-Nagy, whose work and theories on montage were well-known at the Photo League, and who himself had developed them alongside the Russian Proletkult movement. Both Moholy-Nagy and Proletkult were indebted to Ernst Mach, the Viennese philosopher and physicist so hated by Lenin, so influential on left-leaning theoreticians of art in the early nineteen-twenties—including Neurath: The Vienna Circle was formally registered as the Ernst Mach Society. To quote A. A. Bogdanov, a founder of Proletkult: “Art organizes social experience by means of live images not only in the sphere of knowledge but also in the sphere of feelings and aspirations.” Not only in the sphere of feelings, but in the sphere of knowledge, since the point, following Kant's intellectual foil, the philosopher David Hume, was to refashion the relationship of knowledge and affect. Now, consider its title: New York Patrolman George Scharnikow Who Saved Little Baby. Marx once wrote of the French novelist Eugene Sue, that he exemplified the "most wretched offal of socialist literature:" he was like a fifth-rate painter who needed to put a label on everything he painted before the viewer could understand it. 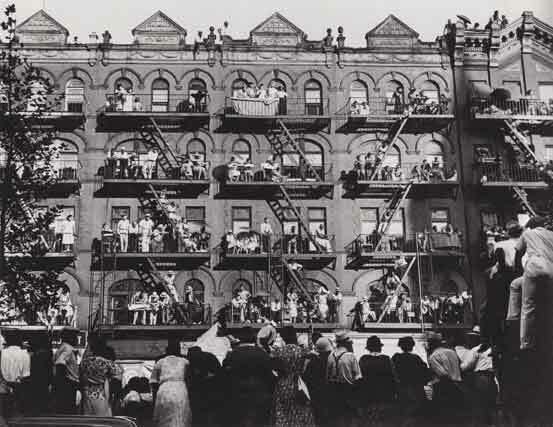 Weegee conscientiously sets before us the most wretched offal of capitalist journalism, offal that discloses itself, not in its positivist matter-of-factness, but in the relationship that the viewer is forced to establish towards matter-of-factness itself. Benjamin again: "What we require of the photographer is the ability to give his picture a caption that wrenches it from modish commerce and gives it a revolutionary use value." It is not enough for photographic practice to bend towards theory: it's the theory that needs to be bent by practice, or what's the point of organizing an exhibition like this one? In those days independent working Americans were proud of being red, which did not mean membership in the Communist Party: it merely meant struggling with the common people against the exploiters. No matter what you've been told to the contrary, we reds knew the difference between the totalitarian, brainwashed CP members, the professional Communists, and ourselves, the reds who wanted not to be encumbered with another hierarchy of bosses. It’s a Mozart and Salieri thing, or a Benjamin and Hannah Arendt thing, which amounts to the same: most higher-up cultural workers in America – the academics, the composers-in-residence, the curators – can bear the thought of someone being more accomplished than they; what they can’t bear's the thought that someone might accomplish so much without making the compromises that they themselves pretend they’ve had no choice but to make: there are, and have been, a few artists and scholars whose success has not depended on sleeping with Nazis. And isn’t that the usual rationalization for Global Capitalism? “Yes, capitalism destroys lives and cultures, but isn’t it’s worth it in the long run?” “Yes, every monument of culture is also a monument of barbarism, but egad, Sir, look at those swirling impastos!” And what if one could create a monument of culture after all that was not, for once, a monument to barbarism? Photograph and be photographed; to hell with hierarchies.